Ugh the graveyard shift again but this is the last one for awhile, if my boss has anything to say about it. Anyway, I know for sure that I am working the swing shift next week so thank goodness for small miracles. In the meantime let me show you what I have gotten done this week! There are only 2 projects on the table that are still WIPs. I still have my mountain of WIPs but these are the only projects that got measurable work done. I did get some other things done but I am saving that for Friday. I am in the home stretch of the LEGO blanket. I got the red completed and have 9 of the 21 yellow done. The great thing is that I have 4 rows put together and I love the result! It really has me motivated to get this thing done. 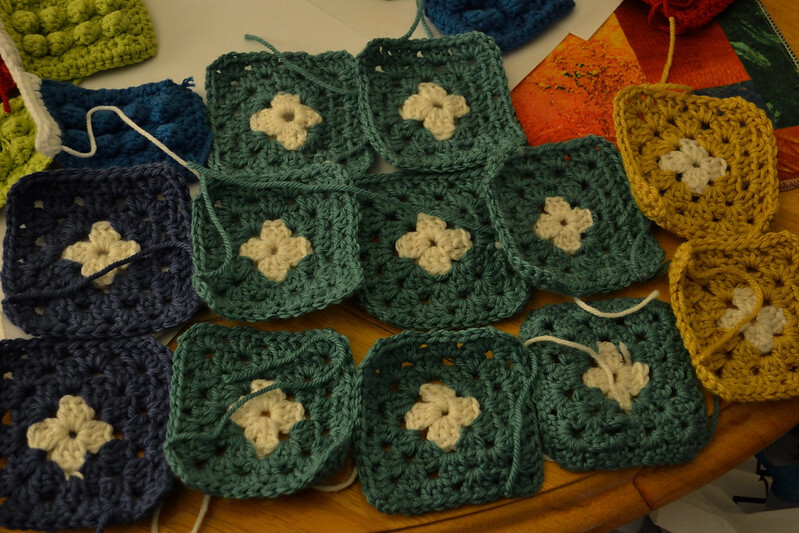 The other project that I have been working on is White Centered Granny Square Blanket. I really like how this project is coming along. Aren't the colors pretty together? I am done with the teal and am working on the blue and gold. I think this is going to be a pretty piece with the Pink, Purple, Coral and Red skeins I have waiting to be used. I love the Lego blanket! The colors are lovely and the little blocks are so cute. Thanks I am starting to love this blanket again! The Lego blanket is really coming together! It looks even more amazing than I imagined it would. That baby is going to be seriously lucky to receive such an amazing gift! I'm also in love with the colors you picked out for the second blanket, I think that is going to be my favorite. I showed some blocks to the parents and they were so pumped. The baptism is in July so I know I will get it done in time. I bet. 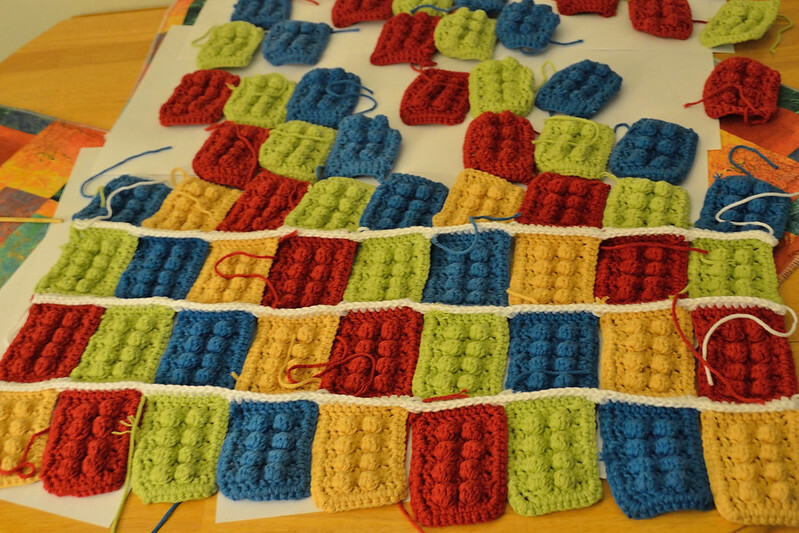 I like the pattern but it is a bit labor intensive. I loved Legos as a child which was part of the reason I enjoy being an engineer now. The Lego blanket is coming together beautifully. Must feel great to be in the home stretch on such a big project! Yeah, I am so happy to finally see the end in sight. I am so happy with how the colors are jiving. Yeah me too. I am so invested in them at first and then I get bored but deadlines help and milestones help to keep me motivated. Love the idea of the Lego blanket. It looks like such fun! Oh thanks Faith. I really love how it's coming together. I get so excited when I walk past my table in my apartment. 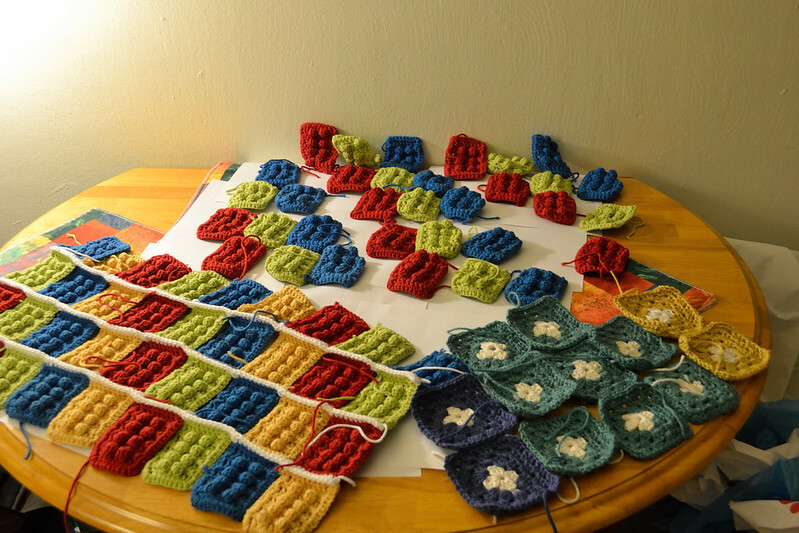 Aren't granny squares fun? And versatile, too. The Lego blanket is going to be so cute. Yeah, I remember when I was trying to re-teach myself crochet and asked my mom if I was doing the stitch right and she took it out of my hands and made a square. Of course I was annoyed because that wasn't what I was asking but I understand how easy it is to just form them from a scrap of yarn. I know I got another row attached today. It just keeps forming before my eyes!